Rigid Marine Lights - Q Series UNIVERSAL - Dezod Motorsports Inc - Home of the automotive performance enthusiast since 2002. Driving Pattern (Driving) – Our engineering team designed the Driving version of our Specter optics system to project light not only far, but also wide. This light utilizes a narrow, oval-shaped reflector that projects both spot and flood beam patterns. Rather than a conical beam, this technology creates an oblong beam that maintains a bright center hot spot, as well as incredible horizontal dispersion. 20º Flood Pattern (Flood) – The Flood version of our Hybrid optics system is a great option if you’re looking for a good area light. While offering just over half the distance of the Spot version, the Flood provides twice the area coverage. The Flood is perfect for those looking for an area light at an affordable price. 10º Spot Pattern (Spot) – The Spot version of our Hybrid optics system projects light over great distances in a concentrated beam. It’s the most powerful spot-style LED light in the industry. This light is perfect for high speeds or any situation where you need extreme distance. The Spot offers a wider beam with less waste than the competition. While maintaing higher center intensity than any other system available. Diffusion Lens (Driving) – Perfect for scene or area lighting, our diffusion lens was specifically engineered to project light at a 60º flood pattern. 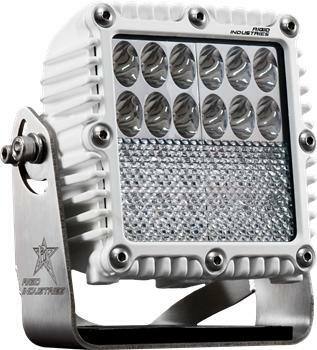 Combine that with our patented optics and you have the best LED flood light in the industry. Like our standard lens, the diffusion lens is made from optically clear, unbreakable polycarbonate plastic.